We have partnered with emergency locksmiths who are available across many locations so they can easily arrive at the emergency within 15-30 minutes. Locked out of car? We can be there in 15 minutes! 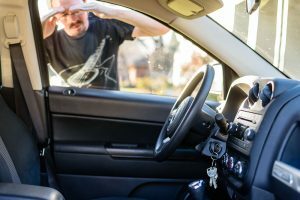 If you are locked out of your car it can be an extremely frustrating situation. The fastest and easiest option is to contact a local locksmith. Being locked out of an automobile requires fast service. At 24-7 Fast Locksmith, our car lockout specialists are ready to respond quickly, no matter the location, Contact us today to about our 24 hour car lockout service. We usually arrive within 15 minutes. Our locksmiths can provide a variety of car lockout solutions that can help save you time and money. Since we carry the most sophisticated locksmith equipment and tools, our car lockout service can be applied differently across a wide range of car makes and models. Upon arrival, our car locksmith will asses your car lockout situation and will get you back in your car without causing any damage to the car door or auto lock. If you are close to a spare key then you can easily unlock your car and retrieve your car keys. If, like so many you are away from home and have locked yourself out of the car, you have a few option to gain access to your vehicle. This popular method has been used for years to try and open locked cars by hooking onto the door latch or door lock. We do not recommend this method as you can get injured, car body and paint damage can be caused when trying to retrieve keys locked in the car. This method can get expensive with repairs to doors, especially if you own a luxury vehicle suchas Mercedes, BMW or a Porsche which has airbags in the doors. As a last resort many will attempt to break the door glass to obtain vehicle entry. This method can be very expensive when replacing door glass and could cause injury from breaking glass, especially if there is an animal or small child inside. We have come across many incidents where customers have tried to pick the lock to gain entry. Various implements are used including screwdrivers, nails and other sharp implements. This method not only has a low success rate but also may result in damaging the lock in the door and may create additional damage which will then later require ignition replacement or door lock change. The fastest and easiest solution is to call 24-7 Fast Auto Locksmiths to unlock your car. Our Car locksmiths use non destructive and approved methods to gain access to your vehicle and retrieve the car key locked in your car. We can gain access in almost any make and model of vehicle, and get you on your way quickly. Our car unlock service is fast and affordable.